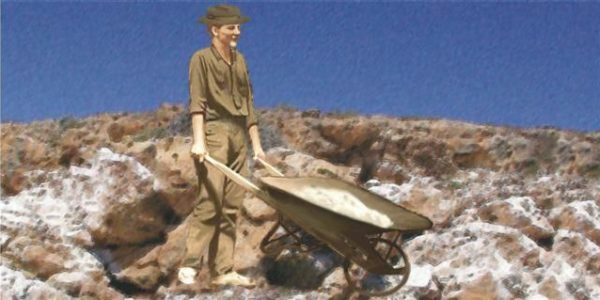 Guano mining was the first land-based industry in Shark Bay and initiated European settlement of the area in 1850. It also provided the colony of Western Australia with one of its earliest commercial exports. Guano was valuable and in demand before development of chemical fertilisers. A Peruvian monopoly on guano made it prohibitively expensive so its discovery in Shark Bay was well received in Australia and Europe. Mining started in 1850 at Egg Island off the east coast of Dirk Hartog Island then progressed to, and quickly stripped, at least 13 islands in Henri Freycinet Harbour. These included Smith, Sunday and Eagle islands, and North and South Guano islands. Anxious to protect this valuable commodity, the Government established a garrison at Quoin Bluff on Dirk Hartog Island in 1850. Another military outpost was later established at Cape Heirisson. Guano was valuable but the stakes were high. Bad weather, uncharted shoals and unsure anchorages made it difficult for large vessels. In 1850 the 443-ton barque Prince Charlie struck the Levillain shoal off Cape Levillain after loading guano. This shoal also claimed the 125-ton barque Macquarie with guano cargo in 1878. The shipwrecked sailors struggled back to Cape Levillain then walked south for three days without food or water until rescued by a vessel in South Passage.